Once again, we begin our season at Delaware Valley University’s beautiful Life Sciences Auditorium. A rare gem by Antonin Dvorak, the exquisite tone poem The Water Goblin, Op. 107, opens the concert, followed by the young trombone phenomenon Brittany Lasch playing Launy Grøndahl’s Trombone Concerto (and perhaps a surprise Duke Ellington arrangement by yours truly!). A Classical masterpiece, Ludwig van Beethoven’s Symphony No. 4 in Bb, Op. 60, concludes the program. Our Winter Concert features hometown favorite Elizabeth Pitcairn, performing Henryk Wieniawski’s virtuosic Violin Concerto in No. 2 in D minor, Op. 22. Johannes Brahms’ moving Tragic Overture, Op. 81, begins the program; after intermission, Edward Elgar’s ever-popular Enigma Variations brings the concert to a close. 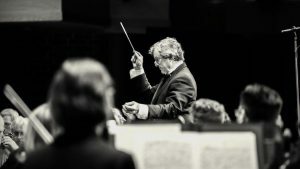 At our Spring Concert, the BCSO’s multi-talented assistant conductor, Sebastian Grand, will lead the orchestra in Wolfgang Amadeus Mozart’s delightful Overture from Così fan tutte, and will also conduct award-winning pianist Ronaldo Rolim in a performance of Franz Liszt’s Piano Concerto No. 1 in Eb major. The rousing season conclusion will be none other than Igor Stravinsky’s great ballet score, Petrouchka. Joining us for our annual Pops Concert will be Tony Award-winning Broadway soprano Debbie Gravitte, singing a passel of great Broadway hits. You’ll not want to miss this dynamic, exuberant Broadway entertainer! And don’t forget to bring your young friends to our December Family Concert to enjoy the exuberant sounds of the young choristers from Holicong Middle School, under the direction of Jim Glaser, with special tributes to Rodgers & Hammerstein—our musical contribution to Doylestown Township’s Bicentennial celebration! Featured soloist is the winner of this year’s Youth Concerto Competition, cellist Anya Chan, performing the first movement of Dmitri Kabalevsky’s exciting Cello Concerto. Support your dedicated neighbors who make up the BCSO family—and be inspired by great music and world-class performers, right in your backyard!